Prime Male is a product designed with the aim of offering multiple benefits associated with male sexual performance. It is a testosterone booster with a lot of extended capabilities, and it is supposedly made entirely out of natural ingredients. 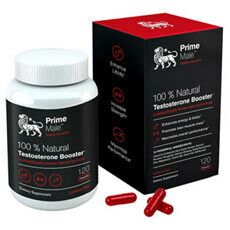 Prime Male is a testosterone booster supplement that claims to have significant prominence in helping men quickly build lean and stronger muscles. Furthermore, the product promises to help shed extra pounds, especially on the belly area. Also, there are claims that the product might help in avoiding insulin resistance hence regulating blood sugar levels in the blood. Additionally, it can increase energy levels and combat fatigue quickly. Who is the Manufacturer of Prime Male? Prime Male Ingredients – Are they Safe & Effective? What are the Advantages of Prime Male? What are the Disadvantages of Prime Male? A company called Propura Ltd is behind this product. It’s a registered company in London that utilizes a range of digital channels to sell their products worldwide. Even though there is limited information about the product, it seems to have achieved a lot of credibility over the years. The product works by using active ingredients that are natural and known to provide a lot of health benefits. It helps in the production of testosterone that promotes the male’s performance by increasing muscle and bone mass. With this said, the ingredients in the product can speed up your metabolic functioning that might help in shedding extra body weight. D-Aspartic Acid– It helps with the regulation of luteinizing hormones and improves testosterone production. Bioperine– This ingredient offers your body the ability to absorb more nutrients. Magnesium– This is a popular mineral ingredient that helps with the regulation of your nerves and blood flow. Nettle Root Extract– This enhances the production of testosterone in your body. Asian Red Ginseng– This is a natural extract that’s capable of elevating your overall energy levels. Boron– This is a boron amino acid chelate capable of improving your overall well-being. The product enhances blood pressure regulation. It helps you build leaner and stronger muscles. It increases your overall energy levels and performance. The product boosts your overall body strength. You might be required to follow a strict diet for optimal results. The product requires regular exercise to work efficiently. How Should I take Prime Male? The serving size is four capsules, and the best time to consume is after meals. By doing so, it prevents the risk of stomach upsets. How much is Prime Male? The product retails for $69 for one-month supply. What is Prime Male Return Policy? The product offers a 90-day money-back guarantee – if you’re not satisfied you can return it and request a refund. This product contains well-formulated ingredients that boost men’s physical performance by promoting the elevation of levels of testosterone in the body. Although it has some benefits, take your time and get an expert’s opinion before you decide to use this product. If you decide against it, you could find another product that claims to be the best male enhancement testosterone booster on the market, which may be more suitable. I’ve always been a staunch supporter of natural products, and I needed to get my testosterone levels up again. Prime Male made that possible for me with other added advantages. My muscles were stronger than before, and I also don’t get easily tired as I used to. It contains nettle root extract which enhances testosterone production. It also comes with a lot of package such as weight loss and regulation of blood sugar levels. I started admiring my body physique and system better when I supported it with exercises. Guys out there should get to know this product. It’s perfect for the body and is 100% natural. I’ve been experiencing all sorts of issues for the past ten years. My doctor recommended I try a testosterone booster. I didn’t really know where to begin. I’m not the fastest or brightest when it comes to the Internet. A friend from my senior home recommended Prime Male to me, so I thought I would try it. I’ve noticed a bit of an improvement, but not enough to write home about, so I’m not sure what I may be doing wrong or if this is the right product for me. I decided to try Prime Male, because I thought it was a good price. I haven’t tried a lot of different testosterone boosters, because of the cost in general. I’m just not sure if it is working for me. I do plan to continue to use it, but in general, I’m just not noticing a huge improvement. I thought taking a testosterone booster would help, so I wanted to try Prime Male. I was having trouble staying or getting hard and my energy levels were very low. I started taking Prime Male about four months ago and nothing has really changed! I’m quite disappointed, because I feel like I spent a good amount of money on it. I wish I could recommend this to other guys, but I can’t. Sexual performance is a problem that worries most men, me included. I do not want to lose my wife. It is quite embarrassing not to satisfy her. I am ready to spend any amount of money as long as my sexual performance improves. I came across Prime online and thought it would be of help to me. This is just a scam. I thought that I would be a beast in bed but nothing happened. I am still performing poorly. My wife keeps complaining, and I feel helpless. This product is not worth it and would advise any man out there to stay away from it. It won’t do anything at all! I wanted to lose weight and build up my muscles, and Prime Male was no help! I started taking this product a couple of months ago at the advice of one of the fitness instructors at my gym. She said it would increase my level of testosterone and speed up the process of building up my muscles. Apparently, the product is also supposed to burn fat and help you lose weight. For me, it didn’t have much of an effect at all. I haven’t lost any weight, and my muscles are still fairly weak. This supplement was a waste of hard-earned money. I wouldn’t bother purchasing it, if you’re looking for real results. I am in my 40s and have been experiencing certain symptoms that are conducive to low testosterone levels. Instead of trying synthetic pharmaceuticals, I opted to try something natural to help raise my testo levels. I was hoping that I would not have to resort to taking anything artificial but after my experience with Prime Male I think I might have to go that route after all. It was a dud. It didn’t do anything to help my symptoms and I don’t think natural testo boosters are a viable option. I believe this worked really well for me. It has increased my strength, increased libido, helped me to lose weight and even increased my stamina during a workout. However, everybody is different; you may not experience all these effects but it’s worth trying. All in all, it’s a good product. Prime Male gave me a very upset stomach and caused mild confusion. After talking with my doctor we suspect the high level of D3 may be the issue. They will not refund your money on a single bottle purchase so be sure this product is ok for you. Mine went in the garbage!